GEORG MUFFAT (1653-1704): Missa in labore requies, ANTONIO BERTALI (1605-1669): Sonata a 13, Sonata Sancti Placidi a 14, HEINRICH IGNAZ FRANZ BIBER (1644-1704): Sonata VI a 5, Sonata VIII a 5, JOHANN HEINRICH SCHMELTZER (c.1623-1680): Sonata XII a 7. Description: The date and purpose of this 46-minute mass are uncertain but it is a great new example of those large-scale pieces with five choirs of vocalists and instrumentalists arranged all around a big cathedral. There are five organists! 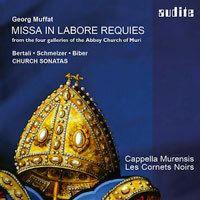 Recorded in the Abbey Church of Muri in north-central Switzerland, this is a sound spectacular. Cappella Murensis, Les Cornets Noirs; Johannes Strobl.